Voice Assistant For Your App #Infographic ~ Visualistan '+g+"
Voice technology is here to stay. We’ve invited smart speakers such as the Amazon Echo, Google Home, Sonos One, and Apple HomePod into our homes and our workplaces. We talk to Siri, Alexa, Cortana, and Google Assistant nearly as easily as we talk to real humans. The trends are clear: Consumers are embracing voice technology, and they’re excited about products and devices that incorporate voice-enabled capabilities. Voice technology can help you engage customers, cultivate their loyalty, and provide a superior customer experience, increasing the value you provide to their lives. Consulting firm Walker predicts that 2020 will be the year customer experience will surpass price and product as the key competitive differentiator. So what are you waiting for? The time is right to begin thinking about how your app or device can integrate voice technology. More and more, your app’s customer experience will be its crucial differentiating characteristic in the marketplace. Consumers want apps that enrich and simplify their lives, and they view voice as a new and exciting way technology can do that. So what are you waiting for? 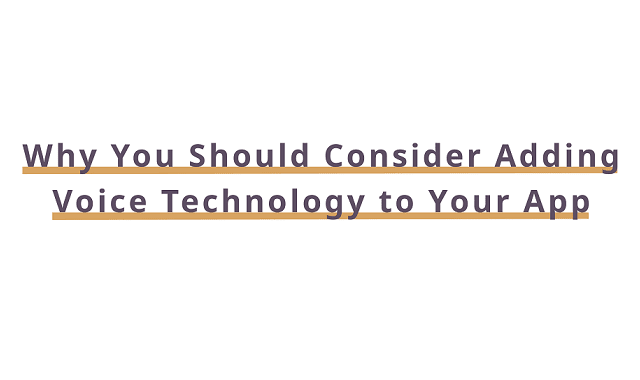 The time is right to begin thinking about how your app or device can integrate voice technology.